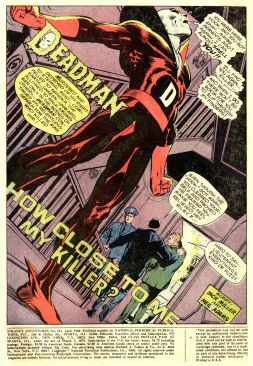 It isn’t news at this point that Neal Adams is taking another crack at Deadman, his breakout character. So I made a note to myself that it’s supposed to hit the outlets in November. That’s plenty of time to decide whether to spend my hard-earned coin on it. But then, another, less prominent announcement came through some of my channels: Clem Robins has been selected to letter it and he is excited. Further, he mentioned that the wonderful Gaspar Saladino had lettered some of the original Strange Adventures tales that Neal had illustrated and that fact was not lost on him. It was a revelation to me. I didn’t realize Gaspar had worked on that book. So I used my go-to source, the Grand Comics Database or www.comics.org and he did letter a few of the covers, but apparently only one story interior. While I’ve long championed and felt a special fondness for the lettering craft and tried to highlight it here at the Silver Lantern, I still can’t tell one letterer’s work from another. I’ve managed to get pretty well-versed on artistic styles, but lettering identification still eludes me. Perhaps one day. In any case, I chased down the story and thought it might be appropriate to highlight it for this edition of the Silver Age Sage, especially since September 1st would have been Gaspar’s 90th birthday. I still miss him a lot. The book in question is Strange Adventures #211 with a publication date of April, 1968. The story is titled, “How Close to Me, My Killer?” It was written by Jack Miller with art by, naturally, Neal Adams, both cover and interiors, with lettering by Gaspar and editing also courtesy of Jack Miller. The first thing Deadman discovers as he’s strolling about town is a very familiar face. It’s Cleveland Brand, his twin brother. Boston briefly wonders whether Cleve could have been involved with the hook. He wants to dismiss it, but then begins to go into flashback mode, recalling some of the clashes the brothers had in the past, and beginning with Cleve approaching him about being part of the high wire act. Boston declined, stating simply that it takes years of practice, causing a snarling retort from Cleveland that Boston always had to be the big shot and that he’d hated him as a child, hoping he’d die. Later, the more errant Brand brother had got mixed up with some shady types, putting their mother into fits of worry. Boston decided to take matters into his own hands, meeting up with a couple of thugs who mistook him for Cleveland and beating the stuffing out of them. Later, he confronts Cleve about it and the twin is less than appreciative, again accusing Boston of grandstanding at his expense. Boston tells Cleveland to straighten up and fly right and illustrates the point with a slap across the face. Cleveland vows he won’t forget this. That was the last time the Brand brothers were together until now, as Boston observes Cleve interacting with his lovely daughter, Lita. He asks if there was any business today at the hotel and Lita tells Cleve that nothing in particular had happened. She queries her father about moving back stateside, as he’d promised, now that her mother is gone. He puts her off, informing her he’s got some business to attend to first and she asks where all the money is coming from, because it sure isn’t from hotel receipts. He merely chuckles, and says he was thinking about how surprised Boston would be at all the money Cleve has now. Abruptly, after cracking open a letter, Cleve announces he’s got to leave again for a few days, much to his daughter’s chagrin. Deadman, however, is on the case and follows his twin to a bus where he’s picking people up and delivering them to a dock on the banks of the Rio Grande. Apparently there’s some human trafficking going on and Cleveland Brand is square in the middle of the smuggling operation. Elsewhere, in Texas, a politician named Alf Jackson is making a speech at a civic community dinner, extolling the importance of the laborers who have helped make the very nation and they deserve any help that can be afforded to them. Later, back at the Alfie Jackson ranch, a meeting takes place between the politician and Cleveland Brand. Jackson asks if the “merchandise” has arrived and Cleve assures him it has. Money changes hands and instructions are given to get them back over the border before dawn as they begin to labor in the fields. Boston’s worsts instincts are validated. Cleveland is neck-deep in an illegal labor exploitation operation. Worse, the authorities have been tipped off and are on their way. In order to dodge the law and preserve his reputation, Jackson insists Cleve take them and dump them into the river to eliminate any pesky witnesses. Cleveland agrees and Deadman howls with rage over it, insisting his brother cannot be a murderer. As the boat and barges begin their journey, however, Cleveland tells Jackson’s agent, Orry Kane, that he cannot proceed. Boston is elated, but it’s short-lived as Orry pulls a pistol on Cleve. Boston decides it’s time to act and takes over his brother’s body to duke it out with the enforcer. Kane goes over the side and Boston takes the opportunity to announce to the laborers that he’s going to the authorities and they need to testify about what’s been going on. Just then, another boat pulls up with a Jackson hired gun that jumps Boston. They both end up overboard and it looks like Boston is a goner when a rope entangles itself with the hireling, giving Brand an opportunity to escape to the surface. Once his head breaks into the blessed, live-saving air, he shouts to Jackson himself to pull the rope up, but Alf has a double-barreled shotgun leveled at Cleveland and is about to eliminate him when one of the laborers hits him with a shovel, causing the shot to go wild. Once aboard, the rope is quickly pulled up, but the other henchman is gone. Boston, leading the labor force, heads back for El Campo with Jackson under the watchful eyes and confiscated weapons of his former workforce. The Deadman saga in Strange Adventures contained some excellent art and some pretty good storytelling, but of course the notion of this endless search for the hook got a little long in the tooth after a while. It was sort of an ongoing storyline, too, not only because Deadman kept coming up empty-handed, but also because, as in the case of this story, it was continuing from the last issue. As my long-time readers know, I prefer a one-and-done or at least keeping things to a 2-parter when possible, so that element doesn’t appeal so much, but these stories also cemented Neal Adams’ place and of course a new kind of character in the DC mythos that has had legs now for decades. I give this one a 7 on my 10-point scale. Enjoyable stuff if a bit pedestrian. Granted, that while he’d had his own title from time to time, Boston Brand, better known as Deadman, is typically a support character. He certainly played an interesting and integral role in Kingdom Come, for example. It’s going to be very interesting to see what Neal Adams has in store for us beginning in November. This issue's second story is a Space Museum tale by Gardner Fox and Carmine Infantino originally published in Strange Adventures #124 [01/61]; a few pages may be viewed on this site. September 15th will have another offering here for your reading pleasure, so don’t miss out. I’ll be going back to some very familiar superhero action. Also remember that my inbox is always at your disposal, so drop a line to: professor_the@hotmail.com. We’re are always interested in your feedback.